Let’s see what we’ve got here: Maggie mad that Rick has never started following her lead as he promised (valid), Daryl mad that people are trying to rebuild civilization instead of just roving in packs in constant conflict, and Michonne trying to figure out how they can establish a code of law to punish people who act like... civilization still doesn’t exist. It appears to be this latter part that sets up the conflict between the communities, as they take different views of whoever’s been found guilty. Criminal justice: It’s tricky! Really, what struck me most from the trailer is that there is absolutely zero sense that Rick is a good leader in peacetime. He’s a hell of a general, and didn’t the maniac you want in charge when you’re dealing with various psychopaths of the post-apocalypse, or even when just fighting for survival. But being in charge when there’s not a common enemy anymore? He looks like he’s in way over his head. 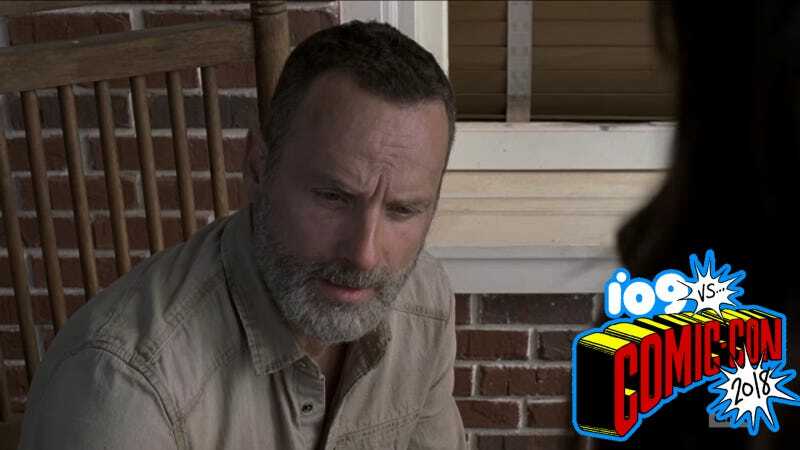 Luckily for Rick, he only needs to put up with it for another season, and then Andrew Grimes is gone. We’ll have more on that—and the rest of the info released at today’s Walking Dead panel at Comic-Con—later today.